Daily Pick: Taco Talk « Get Rid Of Cable | Cut The Cord And Get Rid Of Cable Today! Ever since I decided to get rid of cable one of the things I have found myself most enjoying is the wide variety of things I watch that I wouldn’t have otherwise found. There are a lot of very talented people out there producing some really great content that are sometimes being overlooked because the only thing most people know about is “The Real Housewives of Albuquerque” or whatever other drivel the major networks are putting out that week. A great place to find content like this is Stream Now TV which we have featured in the past. 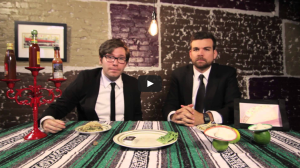 They have tons of great movies and web shows that you might be overlooking such as today’s Daily Pick: Taco Talk. “Taco Talk is a late night styled television show that celebrates the deliciousness of tacos while blowing your mind.” check it out… and if you have anything that the average cable user might be missing feel free to share it with us on our Facebook page or @NoMoreCable on twitter.